The normal skull consists of several plates of bone that are separated by sutures. The sutures (fibrous joints) are found between the bony plates in the head. 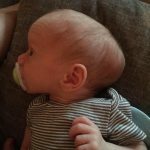 As the infant grows and develops, the sutures close, forming a solid piece of bone, called the skull. 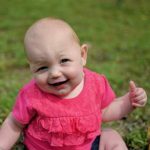 The most common sign of craniosynostosis is an oddly shaped head at birth or by the time the child is a few months old. For example, the skull may become long and narrow. Or it may be very flat and broad in front or back or on the sides. 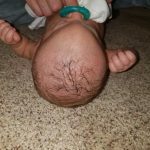 This oddly shaped head may be the only sign of craniosynostosis. The sagittal suture runs from a spot at the front of the head to the back of the skull. Fusion of the suture results in a long, narrow skull with or without bulging of both the front and back of the head. The suture typically will close from back to front. The suture can close at once or slowly over time. The Sagittal suture should never be fused. Frontal bossing, elongated cranium (boat-shaped), prominent occiput, palpable keel ridge, normal head circumference, reduced biparietal diameter (skull longer in anteroposterior diameter), reversed slope of cranium. The Coronal sutures start at the ear and continue superiorly to the top of the skull to meet the sagittal suture. One or both sutures may be involved. With unilateral synostosis, the forehead of the affected side is “swept” back with the eye and the socket. With bi-coronal synostosis(click), the head is short and wide with bulging of the eyes and bulging of the skull around the ears. The metopic suture begins at the nose and continues superiorly to meet the sagittal suture. 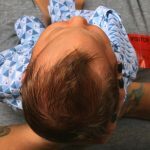 Metopic craniosynostosis results in a narrow, triangular forehead with pinching of the temples laterally. It is normal for the Metopic suture to fuse. 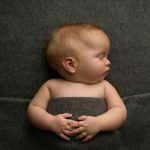 Craniosynostosis is when the Metopic suture fuses, causing pinching and narrowing of the forehead. It is important to have your child evaluated by a qualified craniofacial surgeon to evaluate this suture. 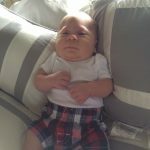 A Metopic ridge alone, does not qualify as Metopic Craniosynostosis. Read more about Metopic Ridge. Pointed or triangular forehead and prominent midline ridge, lateral supraorbital recession, fontanelle usually absent, hypotelorism. Lambdoid synostosis is the rarest type of Craniosynostosis occurring approximately 1 in 40,000 births. It is important that a specialist differentiate between positional deformity and Lambdoid synostosis. This two-sided suture is located on the back of the skull and is shaped like an upside down V. When viewed from above the affected side of the back of the head is flatter than the opposite side. One marker in Lambdoid synostosis is a bump located behind the ear on the same side of the fused suture. Also the ear on the side of the flatness would be pulled “back” (rather than pushed forward like that seen in positional deformity). The suture acts as a gravitational pull and everything will shift toward the fused suture. True lambdoid synostosis, if left untreated, results in pronounced craniofacial asymmetry. Although a diversity of clinical presentations exists, diagnostic features include occipital flattening, an ipsilateral occipitomastoid bulge, and a contralateral hemifacial deficiency. Posterior vault switch cranioplasty is an effective treatment for true lambdoid synostosis when performed in the first year of life. 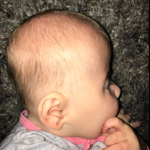 Synostotic frontal plagiocephaly is most commonly caused by frontoparietal (unicoronal) synostosis, but may be caused by other fusions along the coronal hemiring. 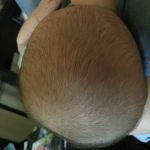 Frontosphenoidal synostosis is a rare cause of frontal plagiocephaly. 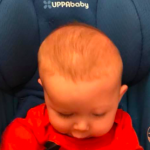 In the case of an infant with frontal plagiocephaly caused by unilateral isolated frontosphenoidal synostosis mimicking frontoparietal (unicoronal) synostosis. The clinical and radiological features include flattened ipsilateral forehead, retruded ipsilateral maxilla, a midline chin, contralateral deviation of the nasal root and endocranial base, and anomalies of the bony orbit. Unilateral isolated frontosphenoidal synostosis may be misdiagnosed as unicoronal synostosis. Careful physical and radiological assessment is necessary to recognise this synostotic disorder of the coronal hemiring. The squamous suture is the connecting joint in the skull between the parietal bone and the lower portion of the temporal bone called the par squamosa. Edges of the squamous suture overlap in a scale-like formation. It is located just above the ears on both sides of the head. The two squamous sutures of the skull combine to form a half circle shape. 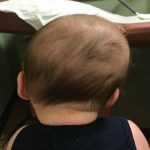 Although squamosal suture craniosynostosis is an extremely rare entity, it is extremely important for the radiologist to be familiar with its radiological appearance in order to prevent misdiagnosis and delayed treatment. Literature on the estimation of age from squamous suture is limited. 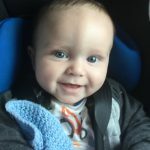 There are a number of associated Craniosynostosis Syndromes, you can read about those here.